Uruguay is currently in the midst of a dual transition. First, there is an economic transition from the 2002 crisis towards a path of equitable and sustainable development, as the economy continues to recover strongly. Second, there is a political transition, as the victory of the Frente Amplio – Encuentro Progresista – Nueva Mayoría coalition in the October 2004 elections marked a new phase in the country’s political history. The Government faces three main challenges in order to succeed with the economic transition, namely: (i) reducing vulnerability; (ii) sustaining growth; and (iii) improving living standards. The challenge of reducing vulnerability relates to debt sustainability, fiscal management and financial sector reforms. Debt sustainability will continue to be a major development challenge in the medium term given the sharp increase in the public debt to GDP ratio as a result of the crisis. Heavy amortizations due in the period 2006-07 constitute a particular source of vulnerability. Strong fiscal management will be the key to reducing the debt burden over time while ensuring an environment of price and exchange rate stability. Policymakers can build on Uruguay’s impressive fiscal performance since the crisis which culminated in a primary surplus of 3.8 percent of GDP in 2004. Meeting the challenge of putting Uruguay on a path of higher longer-run growth will depend upon structural reforms aimed at increasing investment, enhancing competitiveness, and creating an enabling environment for the private sector. Uruguay’s strong rebound from the crisis, with 12.3 percent growth in 2004, has helped create a sound basis for these reforms. In improving living standards, the new administration faces the challenge of bringing the escalating costs of public pensions and health care under control in order to free up fiscal space for essential social investments including an expanded social safety net. Uruguay has experienced a deepening of social exclusion during the crisis and the new Government is committed to addressing the problems associated with society’s most vulnerable groups. The proposed CAS aims to support the Government’s efforts to meet Uruguay’s development challenges in areas where the Bank has a comparative advantage. CAS preparation has benefited from extensive consultations and AAA work. This has included: (i) public discussion of a Sources of Growth study with the current Minister of Finance and his immediate predecessor, (ii) a two day Policy Notes seminar with the full Cabinet, (iii) a Client Survey conducted in July 2004 which highlighted widespread interest in maintaining or expanding Uruguay’s relations with the multilateral financial institutions, (iv) consultations with civil society, and (v) the lessons learned presented in the Completion Report on the 2000 CAS and the 2002 CAS Progress Report. reduced by at least US$300 million with respect to the base case envelope. Unsatisfactory portfolio implementation would also be grounds for slowing new investment lending. 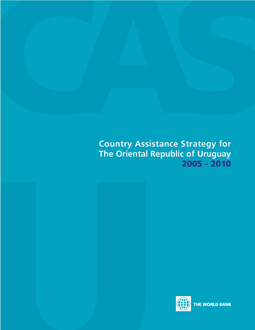 Were reform and investment program implementation to exceed expectations, allowing Uruguay to largely recover its investment grade status, this would open up the perspective of accelerated implementation of the lending program and a possibly enhanced level of Bank support to be discussed at the time of the CAS Progress Report planned for FY08.